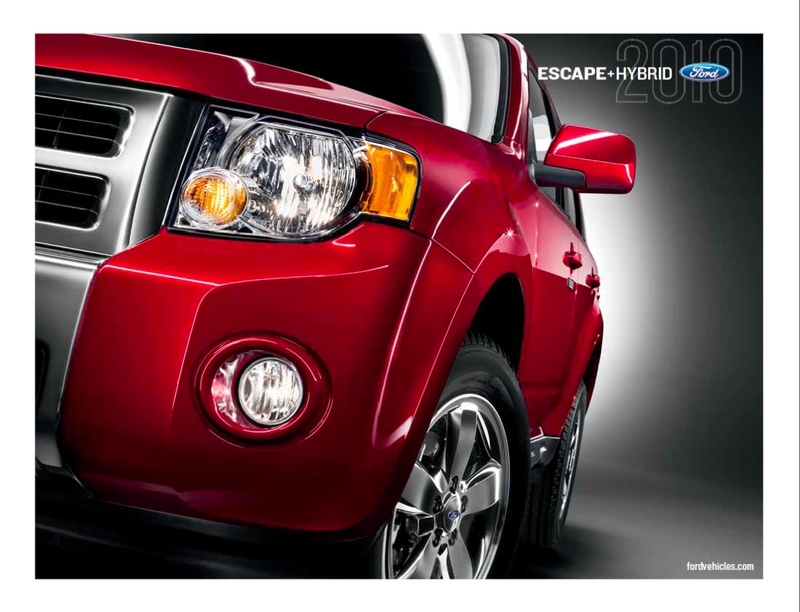 Sales brochure for the 2010 Ford Escape and Escape Hybrid. The gas-powered Escape has a 171hp 2.5L 4-cylinder or a 240hp 3.0L V6. Trim levels include the XLS, XLT, Limited, Hybrid, and Hybrid Limited. Exterior paint color options are listed as Sangria Red metallic, Sport Blue metallic, Sterling Gray metallic, Ingot Silver metallic, Steel Blue metallic, Black Pearl Slate metallic, White Suede, Kiwi Green metallic, Black and Gold Leaf metallic.